Ahh, the famous Fethiye boat trips. We can’t write about all of them in one post or else we’ll be writing all day and anyone reading this will become either very bored or completely overwhelmed with too much information. 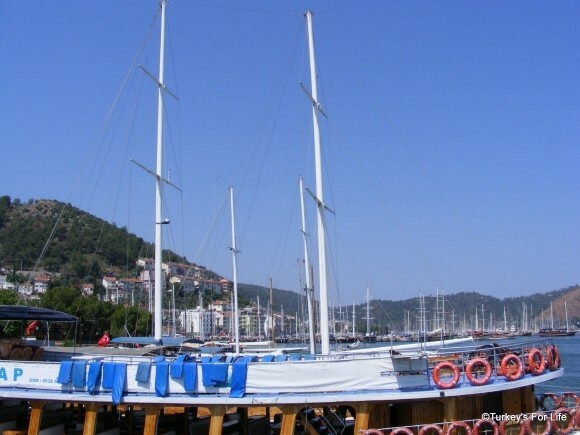 Basically, if you want to do one of the public boat trips from Fethiye, there are three different routes to choose from – the Fethiye 12 Islands boat trip, the Blue Bays or the Göcek Market boat trip. The first two are daily (in season) and the Göcek trip is every Sunday (also in season) to coincide with the market. The most popular of the trips is the 12 Islands boat trip but we were talking about this the other day and we’ve both agreed that our favourite is the Sunday market Göcek trip and that’s the one we did on Sunday (obviously) with our friends. A perfect day out because the Fethiye weather is much more settled now and it’s not too hot to lie on the top deck of the boat in the sun all day. The top photo was taken from the top deck of our boat, Oasis, just before we set off. The boat in the foreground is the most common type of the day trip boats. Sunbathing room at the top and shaded area at the bottom for those who don’t enjoy baking all day – once we hit July and August, if we do a boat trip, we’re usually to be found hiding in the shade. We’re not professional sunbathers. So, on Sunday, the suncream was liberally applied, earphones in, MP3 player full blast and we were away. The reason why we prefer the Göcek boat trip over the other Fethiye boat trips is because you can combine two day trips in one. A day on the boat and a 2 hour break in the beautiful port of Göcek. As most things we do are done on a budget, this is perfect for us. We ate lunch on the boat (included in the price) but if you’re not on a budget, a lot of people choose not to order the meal and then eat once they arrive in Göcek. We arrived there at 13:30 so it’s a good time for lunch. Luckily for us, some friends of ours did this trip on the same day as us but on a different boat. We had a stroll around Göcek and then met up with them for a drink. They’d ordered loads of mezes which they couldn’t finish because they were too full so we all got the benefit of that. She’ll be reading this at some point. Thanks Jan.
Our boat trip cost 20 lira per person including lunch (Summer 2010). The standard choice these days seems to be trout, butterflied chicken thigh or (packet) köfte and all are served with pasta, salad and bread. Vegetarians are usually served an omelette. If you don’t like the idea of spending the day sunbathing with lots of other people and want a smaller boat, it may cost around 25 lira per person. Still a bargain. We were lucky because we went on a huge, cheaper boat that holds over 100 people. There were 30 of us on it, meaning loads of space – and loads of sunbeds. The boat leaves Fethiye at about 11:30 and arrives back at 18:30. We had 2 swim stops (some boats do 3 stops) and just over two hours in Göcek.